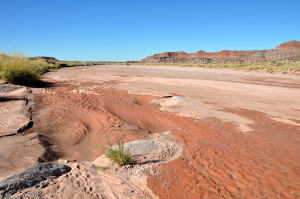 In Tony Hillerman's 1973 Navajo detective novel DANCE HALL OF THE DEAD, Zuni Wash is a reference to the mostly dry river bed of the Zuni River. The Zuni River and its dry river bed, or wash, run southwest from the Zuni Mountains and across the Zuni Reservation until they join with the Little Colorado River just northwest of St. John's, Arizona. "Lithodendron Wash, nearby Zuni Wash, in northeastern Arizona, October 8, 2010" by Finetooth is licensed under CC BY-SA.